← Random Panel: Next up in “Dr. Decapitated Comics”! 1). After the break, A&E’s Biography will be right back with “The El Guapo Story”. Next up, we’ll see how numbers would plague El Guapo to the very end. From 12 men in an 11 man gang to three actors who ultimately ended his reign of terror in Santa Poco. 2). The men leaned in close to listen to what the real brains of the outfit had to say, Jefe’s hand– “Five-Fingered Paulo”. I question the wisdom of wearing masks during meetings, especially if you know simple math might be your gang’s weak spot. It’s just inviting trouble. High stakes games of musical chairs were responsible for more shootings in the Old West than the card game Faro. Glad you noticed that Berserker, I thought that was one of the funniest parts. That’s the entire panel, although obviously there are more people in the room. Still a hoot though. It would be pretty funny if, in fact, their entire gang only has eight guys in it and they really just can’t count. Imagine how many days it takes to count the take after a successful robbery! This happened in a Tin Tin story. Members of a cabal wore a big robe/hood deal, and were infiltrated by Tin Tin. Due to secrecy they had to use code words to find out who was the impostor. It must feel ridiculous to know people could just wander in like that. So, Jeff, what did they do? 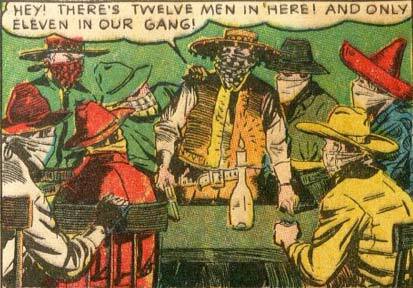 In the finest “Western comics” tradition, they all pulled out their six-shooters and started blasting away. It was a simpler time. Tintin’s the one on the top left.